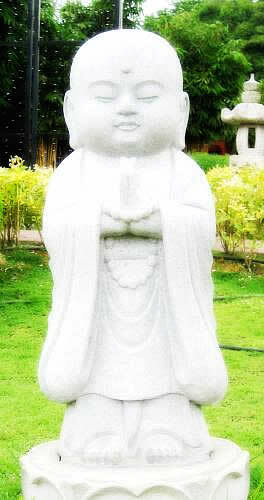 City of 10,000 Buddhas - Why does Gwanyin Bodhisattva Grant a Child? Buddhas, Bodhisattvas, Hsuan Gong Shang Ren, Dharma Masters, and Dharma Friends, tonight is Jin Xiang’s turn to practice speaking Dharma. 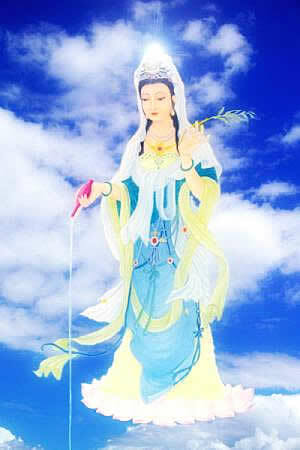 This is a continuation of my investigation into the wonders of Guanyin Bodhisattva. I want to present my report for all of you to consider. If there is any mistake in my talk, please correct me or give me suggestions during or after the talk. The Universal Door Chapter describes wonderful and brilliant skillful means that the Bodhisattva is capable of using, in order to help many beings reach the other shore of liberation. 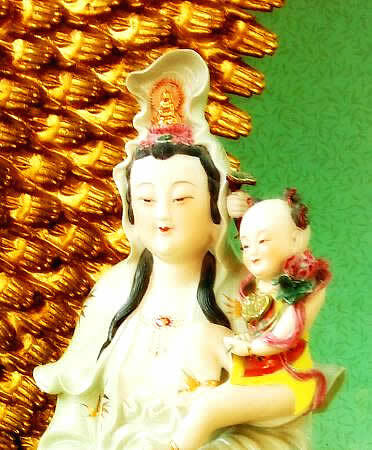 I think many people have, over the generations, come to accept without question that Guanyin Bodhisattva is whom they pray to when they want to have children. I have been reflecting on this particular skillful method in this chapter and thought that it seems like a paradox to what the Buddha has taught. The Buddha says we should get rid of attachment and desire, and here the Bodhisattva seems to be promoting it. In that regard, somebody wondered, “Wouldn’t it make the world’s population grow?” In other words, if all the people were to start praying to Guanyin Bodhisattva for children and their prayers were answered—which indeed have come true for many people—wouldn’t the world’s population increase? So I take this question and ask myself: Besides causing people to be mindful of Guanyin Bodhisattva and making them happy, why would Guanyin grant children to people? Now I want to tell you a story that I’m sure you all are quite familiar with. Yuan Liaofan 袁了凡 (~1550-1624) from the 16 th century Ming Dynasty was a scholar accomplished in many areas. His instructions to his son became known as The Four Lessons of Liaofan. He initially believed in pre-destined fate because predictions made for him came true without fail. He later met a Chan master who taught him that doing meritorious deeds can change one’s destiny, so he followed his instructions meticulously by recording his merits. According to the predictions given to him, he was fated to live up to the age of 53, but he lived up to 74 years old. Originally, he was not supposed to have a child. Upon examining himself, he realized that the reasons he did not deserve a child are: First, he was overly attached to cleanliness, resulting in the lack of any thoughtfulness for others. Second, he had a quick temper, which creates disharmony and counteracts the nourishing of all life. Third, he was overly concerned about his reputation and could not bear to sacrifice anything for the sake of others. Fourth, he talked too much and it wasted a lot of qi (energy). Fifth, he delighted in drinking alcohol, which depleted his spirit. Sixth reason is that he liked to stay up through the night, not conserving his energy. Later he vowed to accumulate three thousand merits to get a son. It took him three years to do that. The number of merits, which can be offset by demerits, depends on one’s sincerity and how extensively one benefits others. One time, he vowed to perform 10,000 merits to pass the jin-shi 進士 level imperial examination. He became a mayor and as such, his wife thought he did not have many chances to help others. But he had a dream in which a god came to him and said that his act of reducing the tax on the rice fields was worth 10,000 merits. From this, you can see that being in a high position, a person can easily generate merit as well as demerit. Therefore, it’s important to train future good leaders from young and also to be a good model for young people. The Four Lessons of Liaofan illustrates eight pairs of goodness: 1) true and false goodness, 2) straightforward and crooked goodness, 3) hidden and visible goodness, 4) actual and pretentious goodness, 5) proper and improper goodness, 6) full and half goodness, 7) great and small goodness, 8) difficult and easy goodness. If you want to know more you can look into it. Here is one example of great goodness. Once there was a high ranking official named Wei Zhong-Da 衛 仲達, who was led into the underworld to be judged for his good and bad deeds. The judge ordered his records of good and bad to be brought out. When the records arrived, Zhong-Da was astounded at seeing the courtyard filled with his bad records and at the single scroll that contained his good deeds. The judge then ordered the two to be weighed. Surprisingly, the bad records were lighter than the single scroll of good deeds. When Zhong-Da asked for the reason, the judge replied, “Once the Emperor planned to build a great stone bridge but you proposed against the project due to the hardship and toil it would cause the tens and thousands of people needed for the work. This is a copy of your proposal to the Emperor. … Although the Emperor did not accept your suggestion, that one thought of kindness you bore for the tens and thousands of people was very great. If the Emperor had listened to you, then the good performed would have been even greater.” Therefore, when one is determined to do good for the benefit of all people, a small deed can result in great merits. If one thinks only about benefiting oneself, then even if many deeds of kindness were performed, the merits would still be small. In Lesson 3, the Way to Accumulate Merits, it mentions: According to t he I Ching, The Book of Changes, families who perform good deeds will enjoy good fortune that can outlast many generations. Once there was a family by the name of Yan 顔. Before they agreed to give their daughter in marriage to the man whom later became Confucius’ father, they looked into the past deeds of the family. After finding the family to be one that practiced kindness and accumulated virtues, the Yan family felt assured that their daughter would be marrying into a family that would be prosperous with outstanding descendants. Sure enough, their daughter later gave birth to Confucius. 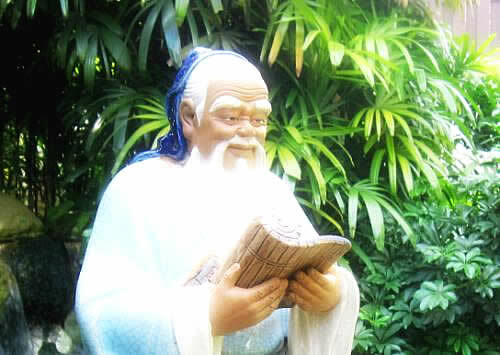 Confucius’ parents had prayed to gods at a nearby hill to grant them a son. So now Confucius’ teachings have benefited countless people for generations. Another example is that of Master Han Shan. Ten days ago, a speaker here spoke of Chan Master Hān Shān 憨 山 (1546-1623) of the Ming Dynasty who was a contemporary of Liaofan. 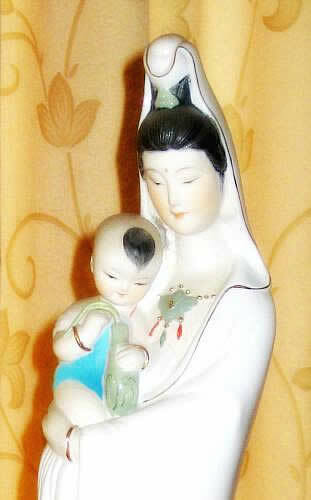 He was conceived after his mother, a devotee of Guanyin Bodhisattva, had a dream of Guanyin Bodhisattva carrying a baby. So through the influence of one virtuous person, moral standard is elevated and people will have a chance to become more wholesome and the world becomes a better place. In that sense, the granting of children who are virtuous is beneficial to the world. In the Four Lessons of Liaofan, he cited an example of the Lin 林 family from Putian, in Fujian Province. Among their ancestors was an elderly lady who was very generous. Every day she made rice balls to give to the poor and always gave as many as they asked for. There was a Taoist monk who came everyday for three years and each day, and he would ask for six or seven rice balls. She always granted his request. 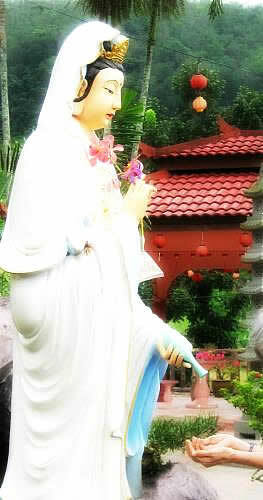 The Taoist monk then recognized her deep sincerity. He said to her, “I have eaten your rice balls for three years with nothing to show my gratitude in return. Perhaps I can help you in this way. On the land behind your house, there is a good place for you to place your grave. If you are placed there in the future, the number of your descendants who will have imperial appointments will be equivalent to the number of seeds in a pound of sesame seeds.” Her son followed his recommendations and buried her there. The first generation after that, nine men passed the imperial examinations and it continued that way for every succeeding generation. There was a saying in Fujian that the results of the imperial examination always had the surname Lin on it. This is a case of how one good person can benefit future generations. Last week, DM Ch’ih ended her lecture series with an emphasis on being responsible with spiritual powers attained from one’s cultivation and that it is more desirable to have virtue than spiritual powers. Now, a recent news article* reported that somebody is planning to launch a video game in which the game players, with a headset that can detect brain waves, can move and crush objects in the video game. If this video game were out, I see its potential to do damage on people’s minds. People who have ill intentions can create quite a lot of trouble in many aspects of the world. Even if people do not have ill intentions and are just playing games, unwholesome seeds are planted in the process of playing this kind of game. More than ever, the world is becoming unsafe. The reason Guanyin Bodhisattva grants virtuous boys and girls to those who pray for a child is to promote and maintain virtue in the world through virtuous individuals, thus transforming the masses of people, and to keep the world safe generation after generation. 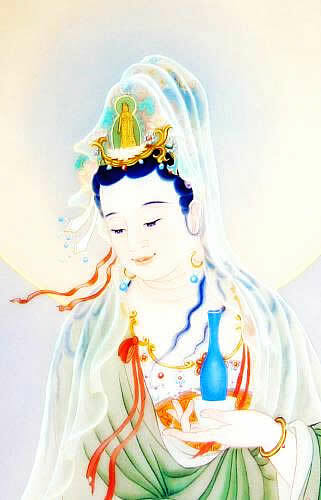 This is Guanshiyin Bodhisattva’s hidden virtue. I hope we all take care of our mind and transfer our good thoughts to all beings throughout the universe. I want to add a few words about an incident. When I was working at a company in Seattle, there was a strike by technicians. In America, it’s a custom for workers to go on strike in order to gain some benefits from their company. One time, the technicians’ union would usually go on strike around Christmas time for many days to get salary raise. Then engineers’ union also went on strike, but after only one day, they returned to work. I think that there may be a connection between education and virtue. When the engineers went on strike, they returned to work because they wanted to get their jobs done and they don’t care about getting a salary raise. I heard that one time an engineer switched to a technician position so he could get a higher pay. We conclude here today.